A few months ago I wrote a guide to installing Player/Stage on a clean Natty Narwhal Ubuntu install for the robot lab I work at. This was on a protected wiki, but I think maybe it'd also be beneficial to the world in general, so I'll guide you through the installation process (with pictures!) in this blog entry. I'm pretty sure this guide will work for any version of Ubuntu that has Ubuntu Software Centre on it, but I've only tested these instructions for Natty. If you followed these instructions to install Player/Stage on a non-Natty version of Ubuntu do leave a comment so that others can know whether it works. A newer version of these instructions for Ubuntu 11.10 can be found here. If you have any problems or questions that aren't addressed here then I recommend you email the playerstage users mailing list. These instructions are for Player 3.0.2 and Stage 4.0.1 which are the most recent versions at the time of writing this guide. It helps to have a computer which you have sudo rights to. If the computer is networked and you can't install stuff on it then ask the network administrator to install playerstage for you, alternatively you can install Player/Stage into your home director, this is also described below. First download Player and Stage. extract the tar.gz files. Right click on the icon of the thing you just downloaded and select "extract here". 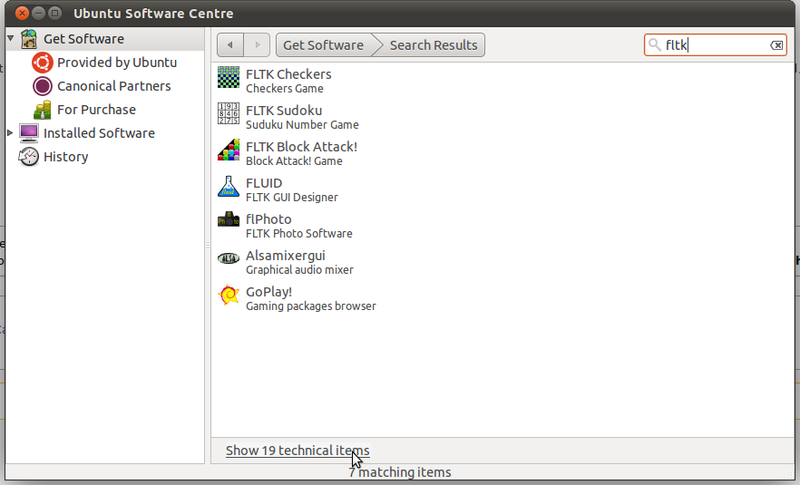 Player/Stage has a lot of dependencies, but they can be installed with Ubuntu software centre reasonably easily. To open Ubuntu software centre (if you don't know how) click the ubuntu logo in the very top left of the screen and start typing ubuntu. It should come up as one of the options. 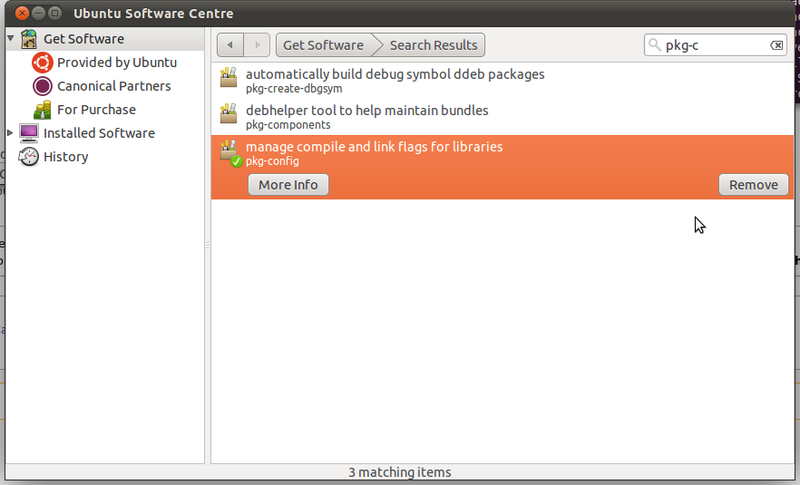 In the top right of the ubuntu software centre there's a search bar. Start typing pkg-config in, that should give you the pkg-config installer. If it's not already installed, then click install. This should work first time, even on a fresh install of Ubuntu. But I don't have sudo! Well then you'll have to install it into your home directory somewhere. This is a pretty similar process, you just have to change the install prefix. in the terminal scroll menu thing that just opened scroll down to CMAKE_INSTALL_PREFIX. If nothing is listed press c, things should appear. whilst it is selected press enter to edit the option and then change it to the folder you want player installed into. if the option appears, press g to generate the make files. If the option doesn't appear press c again until it does. 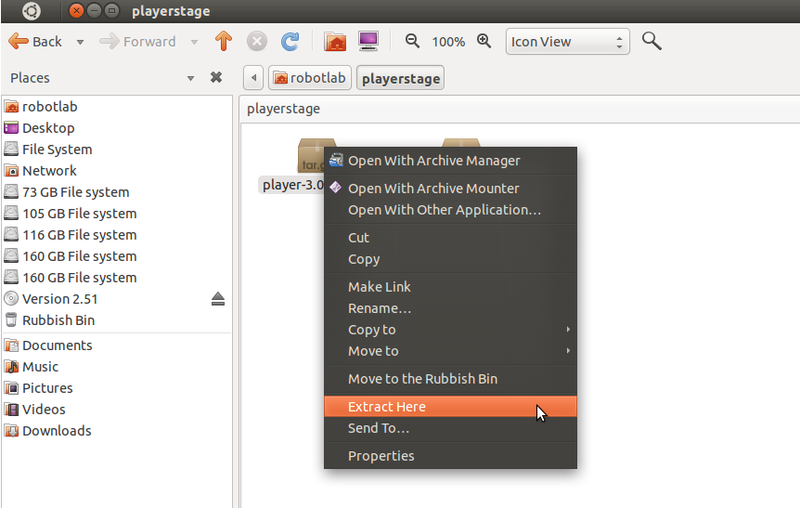 The install is just the same as for Player if you need to install Stage in your home folder or somewhere. Follow steps 1,2 and 3 above for configuring pkg-config (otherwise this will not work). in the terminal menu thing that just opened scroll down to CMAKE_INSTALL_PREFIX. If nothing is listed press c, things should appear. The stage source code has some handy code that should work if you've got everything installed. To test your install in your terminal go to the /worlds directory in the source code folder. Type player simple.cfg into the terminal. In the unlikely event that that works you've successfully installed Player/Stage! player: error while loading shared libraries: libplayerdrivers.so.3.0: cannot open shared object file: No such file or directory. export LD_LIBRARY_PATH+="whatever install prefix you made"
* Player comes with ABSOLUTELY NO WARRANTY. This is free software, and you are welcome to redistribute it under certain conditions; see COPYING for details. error : Failed to load plugin stageplugin. Very nice! I am still using Player/Stage on Ubuntu 10.04, have not yet ventured into Ubuntu with Unity.Being a GNOME enthusiast Unity is blasphemous. Still, I look forward to Ubuntu 12.04, which will be an LTS release. First time happened at 98%, but when I tried again stopped at 82%. Please try to download zlib 1.2.5 from zlib.net website, extract, configure, make n install it. This solution works for me! # warning "Boost.Signals is no longer being maintained and is now deprecated. Please switch to Boost.Signals2. To disable this warning message, define BOOST_SIGNALS_NO_DEPRECATION_WARNING." Did you get the solution for this error?